The Great Prayer of Thanksgiving is a central feature of the liturgy for the Lord's Supper in Presbyterian and Reformed traditions. 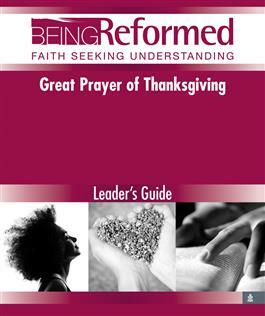 Being Reformed: Great Prayer of Thanksgiving will strengthen our faith in God, who has acted in history, who continues to lead and guide us, and who will bring us together in the joyful feast of the people of God. Being Reformed: Faith Seeking Understanding is a series of biblically based studies that provides adults with a foundational understanding of the Reformed faith. Each six-session studywritten by well-known and respected scholars features Scripture, prayer, in-depth commentary, and questions for reflection.